NYC. Had the most amazing weekend running around town doing touristy things with Nicole and one of my favorite places we stopped by was the Brooklyn Bridge. Eventhough I’ve been to New York countless times, one of the places I’ve never visited is the Brooklyn Bridge, so for me it was a dream come true to finally go there. Although shooting blog pictures on top of a bridge in the middle of a storm might not have been our brightest idea, it still was a magical experience watching the pastel colored sunset over the city! COAT Marc Jacobs (here or here). PANTS Zara. BOOTS Din Sko. BAG Proenza Schouler. BEANIE Asos. SUNGLASSES Céline. This entry was posted in Outfit and tagged brooklyn bridge, garypeppergirl, Marc Jacobs, New York, Nicole Warne by Carolina Engman. Bookmark the permalink. I just LOVE this coat !!! it’s a stunning piece !! I’ve always wanted to go to the Brooklyn Bridge! Great photos! You both look lovely! Amazing pictures ! And you look fabulous ! Wonderful pictures! Girls, you look brilliant! Very nice pics and that coat looks great. Have a nice day. these are such amazing pictures!! Amazing photos. Especially loved the first one and your coat . The first picture is just amazing! Great coat and shoes! I would like to visit the brooklyn bridge too… the sky looks amazing! The photos are so beautiful! New York is such a wonderful city! These pictures are beautiful, you and Nicole look stunning!! Fabulous shots! Loving your coat! Lovely!!!! I did similar photos some days ago during the Fashion Week!! :) I still have to publish them… I miss NY! The gorgeous skies behind the bridge made risking the storm all the more worth it. Great shots. Love your boots and PS1. Very beautiful pics! Love how beanies look on you! These are just the cutest photos! I love the leopard coat and the red lip, and love the casual vibe the beanie lends to the whole thing! So cute. Beautiful pictures and what a lovely coat! Perfect photos and that coat looks so good with all black! Gorgeous photos and the coat looks so good with all black! But i also love so much your coat!!!!!! Such a bunch of so beautiful pictures. The lighting is great and I am so absolutely smitten by your coat. You girls are just so beautiful!! Love these photos! The makeup really makes the whole shoot pop. Great photos! And love the coat! You looked like a star, amazing NY pictures! Gorgeous photos and I love your coat! Love the coat and bag. Great look. ohh my favorite city :) can’t wait to move there in few weeks! Also. loving the leopard print coat!! Two absolutely gorgeous girls! I miss NYC – you guys captured it at pure perfection! Your styling is awesome I love the outfit!!! Love that last picture- it’s beautiful. This is what I call a “speechless photoshoot”. When you have an amazing amateur photographer, shooting you with New York City on the backdrop, there isn’t much left to say about it. It is just perfect! I’m visiting New York tomorrow for the first time in 10 years! Its great to live vicariously through you until then. I love how your hair stands out in contrast with that gorgeous coat! Beautiful shots. You both look so pretty! Adore your coat Carolina. I’ve also never done Brooklyn bridge, but your photos have inspired me to next time I’m in NYC. Love your coat, beautiful pictures! 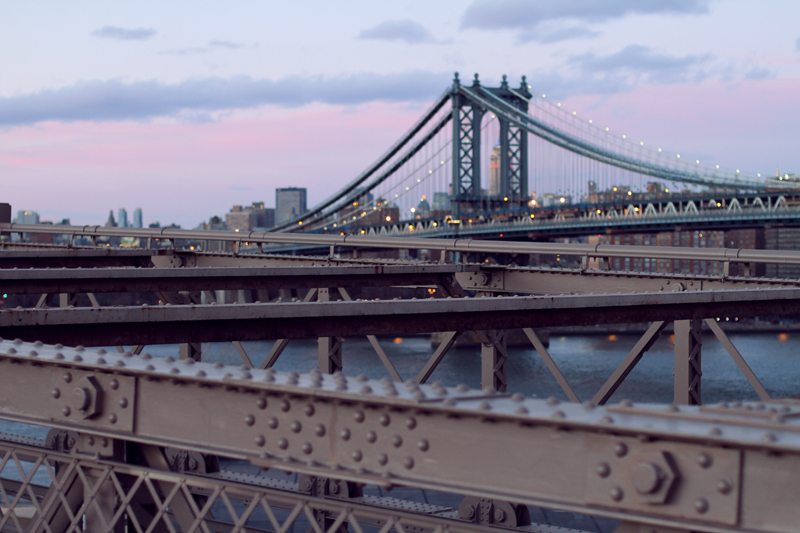 It looks truly magical on Brooklyn Bridge – the views are breath-taking from it as well. However the last time I went to NYC they had all this construction stuff on the Bridge which meant it wasn’t a great place to snap photos. The first photo is amazing! Cool picts!? I LOVE THIS WHOLE OUTFIT!!! We started a blog recently. Someone wants to visit us? Amazing pics Carolina, and you look super pretty! God how i love the pictures and your handbag! This is awesome! Can’t wait to go to NYC myself. The pictures came out really cool, and I just LOVED your outfit! I’m still not sure how I feel about this wool hat trend, but it looks so good on you! Love your jacket – the print is fantastic! Beautiful pictures! The last one is magical! you and Nicole are a stunning duo, love those pictures, the lighting is perfect, seems so magical! Las fotos son preciosas, el abrigo ideal. Tu amiga es muy guapa. Love the last shot! Brooklyn Bridge is so beautiful; I’d really like to go to NY someday! sooooooooo beautiful pictures! wanna come to ny! Beautiful pictures, is also one of my fav Spots here in ny. absolutely gorgeous! and what camera was used?! That first picture is a dream! You ART the fashion look of NYC and Me heart the view. Many blessings. Great Coat! Love that you’re rocking Marc in NYC! My review of LFW’s top trends is up on Local & Opulent. Beautiful pictures, New York looks so pretty! These are beautiful pictures! I love that coat! Your coat is very New York Chic! Great outfit! they make me miss ny so much! These pictures are breathtaking! The outfit is great – dark with that fabulous coat!! We love it all! Wauw – I love the last picture. Amazing coat! ? Great photos! Loving your pics of the bridge! What a great backdrop! And that shade of lipstick is perfection! Being a leopard lover I could hardly miss this one, not exactly the same print, but close enough, and I love how you styled it, not to even mention your photography, stunning!!! You’re on the wrong side of the line! One is for walking, the other is for biking.